Home | Blog | Ask Our Experts: What is hot water radiant heating? Ask Our Experts: What is hot water radiant heating? Hot water radiant heat keeps your family comfortable year-round! What is hot water radiant heat? How does it work, and when should I consider it for my project? Hot water radiant heat is a type of heat distribution method that relies upon heated water being piped through tubing that lies in your home’s floors or ceilings. While hot water radiant heat provides a cozy, warm, evenly-distributed heat to your living spaces, it may be impractical or cost prohibitive to install in certain circumstances. Hot water radiant heat is a type of heat distribution method that can be used in homes and commercial spaces alike. In short, water is heated by a central boiler and then pumped through tubing that sits underneath flooring or above the ceiling. Through a heat exchange, heat is given up from the tubing into the living space. The water then returns to the central boiler to be reheated and cycled through the system again. Some people question the possibility of installing hot water radiant heating systems in existing homes. While it’s best to install this type of system during new construction, it is definitely feasible to install “after-the-fact” as well – under certain circumstances. In order to install the tubing in existing flooring, the underside of the subfloor must be readily accessible. Keep in mind that the tubing can be installed in a poured concrete floor, above the subfloor within a poured underlayment, or under the subfloor between the joists. You can see how the installation process is much easier during initial/new construction – but definitely possible for some existing buildings. Some contractors refer to hot water radiant heating systems as “upgrades.” This is because hot water radiant systems take the place of unsightly baseboard, convector, or cast iron radiators that may otherwise put a damper on your living space motif. Additionally, hot water radiant heating systems provide a warm, cozy, comfortable heat that is evenly distributed throughout the room. What’s more, hot water radiant heating systems can even be “zoned” to allow for individual room temperature control. Finally, some people ask whether hot water radiant systems are “more energy efficient” than other types of heating systems. This really depends upon two things: 1) system design, and 2) the efficiency of the boiler used. Keep in mind that hot water radiant systems are for heating only. 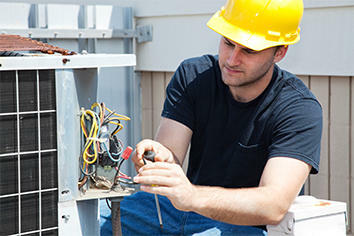 If air conditioning is required as well, an entirely separate system would need to be installed. This may be cost prohibitive in certain circumstances; thus, other HVAC systems may be considered instead. Hot water radiant heating systems are definitely worth consideration, especially during the new construction process. They provide a warm, cozy heat that’s evenly-distributed throughout living spaces. Just keep in mind that air conditioning will require an entirely separate system if desired. For professional assistance with this and other HVAC work, Tuckey is the local expert to call. Keep our number handy – you never know when you might need us! Call (717) 524-11936 or visit www.tuckey.com for more information.